Methuselah was easily the best character in the film. The 969 year old patriarch was played by Anthony Hopkins, who was actually believable as a 969 year old man (Cheyne said he bore a striking resemblance to Gollum). He also apparently is an early ancestor of Benny Hinn, because he had the innate ability to slay people in the spirit. And he had an affinity for berries. In every scene he appears in, he talks about his desire to enjoy berries one last time. He chides his great-grandson for not giving him berries. He asks his daughter-in-law why she didn’t bring him berries. And before the floods descend, he frantically scrambles through random foliage in his pursuit of those sweet, sweet berries. As the waves come crashing toward him, he smiles as he finally finds a small, purple berry. He lifts it to his mouth, hoping to enjoy the tasty treat one last time before he dies. And as this happened, I totally thought the wave was going to destroy him before he actually got to eat it. Because that’s how “the Creator” is portrayed in Darren Aronofsky’s Noah. My recommendation: Don’t see it. Not because I’m afraid of what it will do to your faith or your walk with God. But because it was a terrible film. It won’t entertain you. It won’t benefit you. And you will definitely consider it a waste of $12.50 (or $19, if you wanted to see it at a fancy movie theater like I did). I had high hopes for the flick, but I knew trouble was afoot when the infamous disclaimer didn’t appear at the beginning of the movie. After seeing the first two minutes, I could tell this was going to be a stupid movie. At around the eight-minute mark, I decided this wasn’t a movie I’d want my kids to see. And then the Rock-People showed up. I have a feeling that many Christians will not like the film. And I can predict why they won’t like the film. And honestly, there are some good reasons to avoid the movie and some bad ones. I want to present those to you now. I’ll admit it. The Rock-People were kind of dumb. And they were poorly animated. And they were a bunch of wussies. But having said all that, they weren’t entirely unsanctioned. Genesis 6 does make passing references to “the nephilim,” a word that is usually translated “giants” or “dead ones.” The director interpreted them as “Rock-People.” And that’s his prerogative. Is that what nephilim were? Probably not. Did the nephilim really build the ark for Noah? Probably not. Should the existence of Rock-People in the film be the subject of our criticism? Probably not. Noah didn’t have a daughter. But he did have several daughters-in-law. Is it possible that one of his son’s wives lived with them before they tied the knot? Sure. So let it go. One scathing review of the movie I came across complained that the movie depicted Noah rescuing all “species” of animals rather than all “kinds” of animals. The reviewer claimed that this was a subtle affront on creationism. Buddy, there were plenty of blatant affronts on creationism. Why complain about the one that probably wasn’t even a thing? 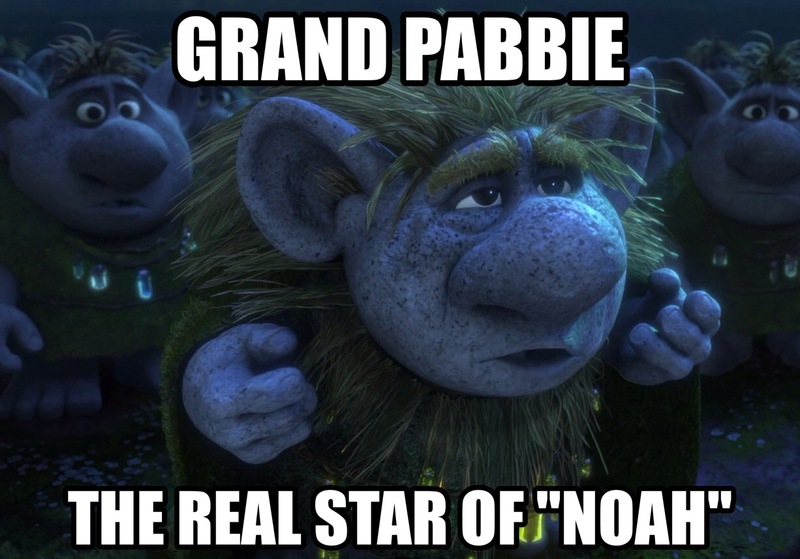 And far from “walking faithfully with God,” the film’s Noah hardly knew God. He joins an agnostic choir that includes the film’s main antagonist and the Rock-People when he screams at the heavens, asking why God won’t answer him and why God is forcing him to murder his children. Was the Creator really asking Noah to murder his kids? We don’t actually know, because God never shows up in the film. God only “speaks” to one character, and even though Noah “trusts that God will speak in a way he can understand,” God doesn’t. He speaks through cryptic dreams and esoteric visions, leading Noah to almost stab his grandchildren to death to fulfill what he believes to be God’s will. The film presents us with two options as to God’s intentions for mankind. 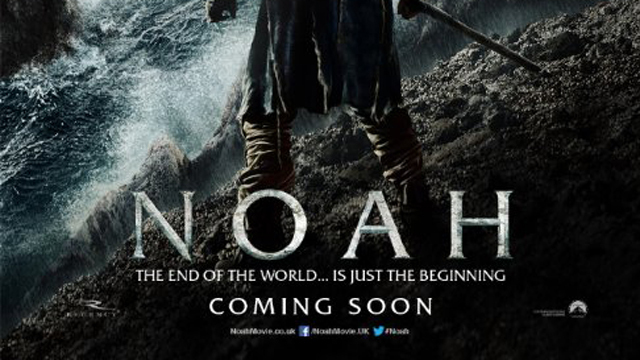 One, God left the decision of man’s fate in Noah’s hands, allowing him to decide whether humanity deserves to survive. Or two, God made a mistake by selecting Noah, because ultimately Noah was unable to do what needed to be done; namely, to make sure no humans survived the flood. Either way, it was Noah’s love for his children rather than God’s love for His children that explains why we are still around today. Ultimately, you aren’t going to like the movie. All blasphemy and misrepresentation aside, it just wasn’t that good. I went into that theatre with an open mind and honestly was hoping it’d be good, but before the opening credits were over, I could tell it was going to be a waste of an evening. Like I said before, I’m not deterring you from seeing the flick because I’m afraid it might upset your faith; I’m afraid it might upset your credit card. Save your money for Captain America: Winter Soldier. That’s a film that won’t disappoint (mainly because it wasn’t written by Aronofsky). The reason God saved the animals is because He loved us, not the other way around. By grace we are saved. We are the apple of His eye. We are the object of His love and affection. We are His children. And He loves us with such a great love. 6 Noah was 600 years old when the flood covered the earth. 7 He went on board the boat to escape the flood—he and his wife and his sons and their wives. 8 With them were all the various kinds of animals—those approved for eating and for sacrifice and those that were not—along with all the birds and the small animals that scurry along the ground.9 They entered the boat in pairs, male and female, just as God had commanded Noah. 10 After seven days, the waters of the flood came and covered the earth. 13 That very day Noah had gone into the boat with his wife and his sons—Shem, Ham, and Japheth—and their wives.14 With them in the boat were pairs of every kind of animal—domestic and wild, large and small—along with birds of every kind. 15 Two by two they came into the boat, representing every living thing that breathes. 16 A male and female of each kind entered, just as God had commanded Noah. Then the Lord closed the door behind them. 17 For forty days the floodwaters grew deeper, covering the ground and lifting the boat high above the earth. 18 As the waters rose higher and higher above the ground, the boat floated safely on the surface. 19 Finally, the water covered even the highest mountains on the earth, 20 rising more than twenty-two feet above the highest peaks. 21 All the living things on earth died—birds, domestic animals, wild animals, small animals that scurry along the ground, and all the people. 22 Everything that breathed and lived on dry land died. 23 God wiped out every living thing on the earth—people, livestock, small animals that scurry along the ground, and the birds of the sky. All were destroyed. The only people who survived were Noah and those with him in the boat. 24 And the floodwaters covered the earth for 150 days. But God remembered Noah and all the wild animals and livestock with him in the boat. He sent a wind to blow across the earth, and the floodwaters began to recede. 2 The underground waters stopped flowing, and the torrential rains from the sky were stopped. 3 So the floodwaters gradually receded from the earth. After 150 days, 4 exactly five months from the time the flood began, the boat came to rest on the mountains of Ararat. 5 Two and a half months later, as the waters continued to go down, other mountain peaks became visible. Then God blessed Noah and his sons and told them, “Be fruitful and multiply. Fill the earth. 2 All the animals of the earth, all the birds of the sky, all the small animals that scurry along the ground, and all the fish in the sea will look on you with fear and terror. I have placed them in your power. 3 I have given them to you for food, just as I have given you grain and vegetables. 4 But you must never eat any meat that still has the lifeblood in it. 18 The sons of Noah who came out of the boat with their father were Shem, Ham, and Japheth. (Ham is the father of Canaan.) 19 From these three sons of Noah came all the people who now populate the earth. 20 After the flood, Noah began to cultivate the ground, and he planted a vineyard. 21 One day he drank some wine he had made, and he became drunk and lay naked inside his tent. 22 Ham, the father of Canaan, saw that his father was naked and went outside and told his brothers. 23 Then Shem and Japheth took a robe, held it over their shoulders, and backed into the tent to cover their father. As they did this, they looked the other way so they would not see him naked. and may Canaan be his servant! 27 May God expand the territory of Japheth! 28 Noah lived another 350 years after the great flood. 29 He lived 950 years, and then he died.